The UK’s Gomez emerged at a time when Brit-pop was at its peak but theirs was a more unique and experimental sound that blended blues-rock and rootsy ramshackle folk with strange vintage synths and a chameleonic vocal style originating from the band’s three vocalists. Consisting of Ian Ball, Ben Ottewell, Tom Gray, Paul Blackburn and Olly Peacock, the quintet’s fully-formed retro-minded yet modern debut album, Bring It On, was released in 1998 on Hut/Virgin Records and won the Mercury Prize that year, beating out contenders and label mates, Massive Attack and The Verve. The album featured the singles, "Get Myself Arrested," "Whippin' Piccadilly," and "78 Stone Wobble," along with standout tracks “Get Miles” and “Tijuana Lady”. 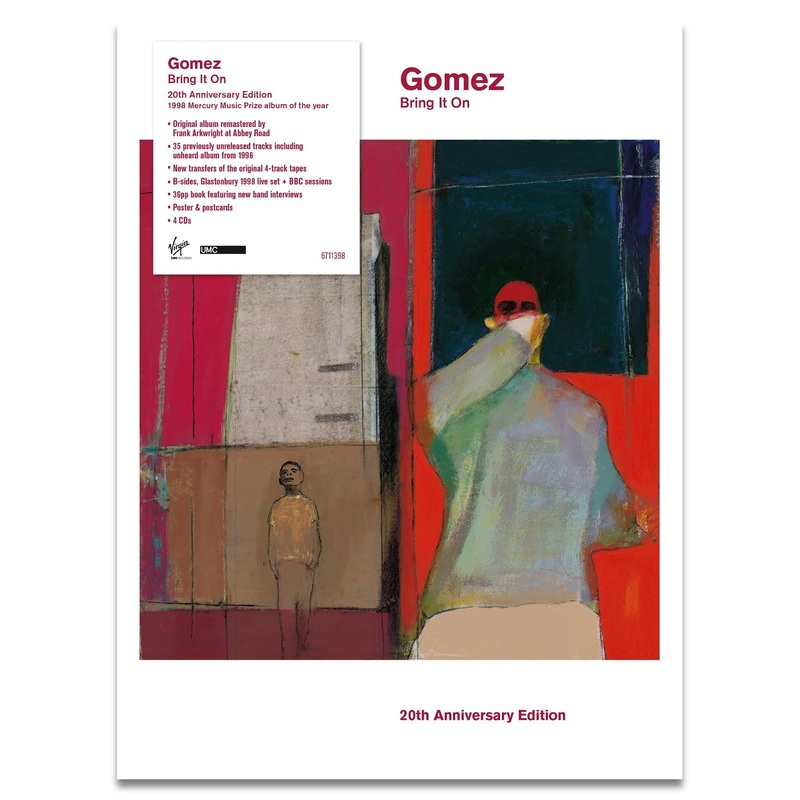 To celebrate the 20th anniversary, Virgin/Ume has reissued Bring It On as a Super Deluxe 4-CD set that includes the album, remastered by Frank Arkwright (who originally mastered the album) at Abbey Road and includes 35 previously unreleased recordings including, covers of Neil Young's "Unknown Legend" and "T-Bone Walker's Mean Old World", the legendary early 4-track demos, BBC sessions and a live Glastonbury set from 1998; equaling over four and a half hours of music. Additionally, the Super Deluxe set includes a lengthy essay written by music writer Paul Stokes, featuring new interviews with the band and those close to them. It is also made available as a 2-LP set on 180g vinyl in either standard black or red and yellow colorway with gatefold packaging.